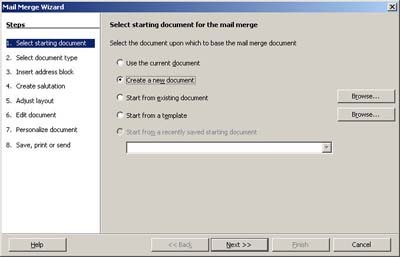 OpenOffice 2.0's vastly improved Mail Merge Wizard 2.0 has the chops, and it's pretty cool, says OpenOffice expert Solveig Haugland. Find out how to use it in this step-by-step tour. In my exploration of the new features in OpenOffice 2.0, I've bypassed one that's handy and powerful. Yes, folks, I'm going straight for the glamour, offering you a how-to on the mail merge wizard. Mail merging may not be exciting, folks, but it's a common workday task for many people. That's why I'm taking you on this tour of new mail merge options in OpenOffice 2.0. In part one, I'll take you on a step-by-step walk through the setup process. In part two, I'll show you the cool features and discuss alternatives to the mail merge wizard: the letter wizard and creating a mail merge from scratch. Strictly speaking, mail merge is not a completely new feature in 2.0. There were whiffs of it in 1.x, but it is improved, extremely improved. It's at the "powerful but complex" end of the continuum rather than the "simple but easy" end, but I think that's a good choice. Get ready. 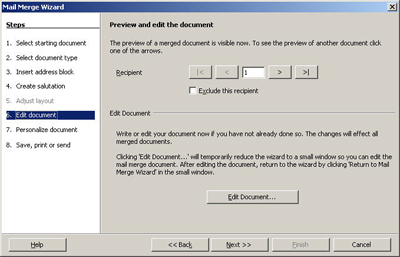 Here's your first look at the mail merge wizard. A mail merge is writing one document, and then creating a version of it for every record in a database. 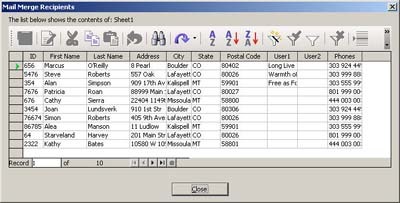 So, you write your holiday letter once and easily create one copy of that document for everyone in your address book database. Or you write one "please-pay-us-now" letter and send it to everyone in your customers database for whom the Paid field is No. So, you need to do two things: create the document and point the document at the database. The mail merge wizard does both. Initially, I had mixed feelings about the new mail merge autopilot, to say the least. There's lots of complicated stuff in it. The windows require you to click a lot from one window to another to get a merge set up the first time; it's a big pain in the patookus. And the wizard's a little stupid, frankly; when I worked with it, it didn't see that it should map its own preset Address Line 1 field to your Address field in your database. Once I got through all the windows, I got to the good stuff. Tthe advanced features offer such goodies as a "line item veto" ability to exclude particular records from the mail merge and the ability to more easily edit individual merged documents. It's worth the clicking around to get these features. So all in all, I like the autopilot. I don't love it, but if you're savvy enough to do a mail merge, you're going to be able to figure out how to use the tools. Note: To start the mail merge wizard, you have to choose Tools > Mail Merge Wizard. I think the division between this and the Letter/Fax wizard under File > Wizards is a little odd. Why not choose Tools > Wizards > Mail Merge? I'm mystified. Here's how it works. You decide what you think. Choose Tools > Mail Merge Wizard. Now, the mail merge wizard doesn't provide the same type of design-on-the-fly templates as the letter wizard does. If you want to start from a template, you have to have that template file on hand. For this demo, I'm just going to use a new empty Writer document. Click Next; in window two you get to just choose whether it's a letter or e-mail, which is simple. Click Next again. Now, we've come to specifying your database fields in a Long Setup Process. This window is the crux of the whole business. This critical step is just the beginning. There are five or six other windows you need to burrow into to get the layout just how you want it. Take a deep breath. We're going in! 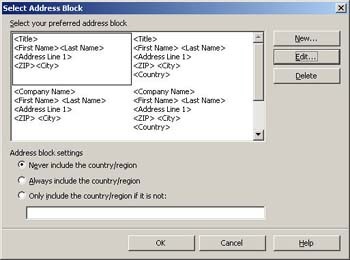 To get the database you want, click Select Different Address List. You get this window, and you see all your databases and the table you want here. 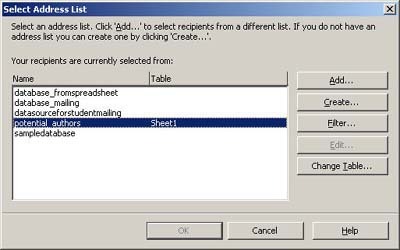 When you select the database, eventually a table option like Sheet1 (if your database is based on a spreadsheet) will appear under the Table heading. However, if you want something different, you need to click the Change Table button. You then get this window. If you're not sure, you can click Preview, an option I like very much, and see this window. If you see the table you want here, then click Close to close it. Select a table and click OK, and click OK again in the database-selection window. Tired yet? You're just getting started! You need to make sure that the fields in the address block of your mail merge are correct. When I started making mail merges, I couldn't get the defaults I wanted. Keep at it. You will prevail. 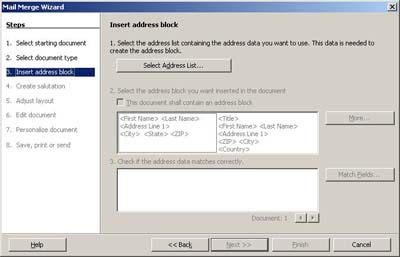 Click on the This Document Shall Contain an Address Block item, if you want that in your mail merge. Click More. You'll get this window. There are some preset ones to choose from, none of which were what I wanted when I started this. At any rate, then you click Edit. In the window that appears, use the insert/remove arrows on the left, and the up/down/right/left arrows on the right side to position. I personally find it a big, big annoyance not to be able to just cut and paste, and use the space bar to position the fields. Click OK, and click OK again to get back to our friendly Wizard Window 3. Why is this "unavailable" data showing in the preview area? 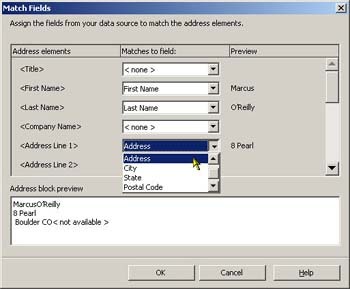 To fix this, click the Match Fields button to show the wizard that the Address field in your database corresponds to the wizard's concept called Address Line 1, and your PostalCode field corresponds to the wizard's concept called Zip Code. Click OK. It looks good. At last, you're done with the setup. Now, let's go to part two and have some fun with the cool tools in 2.0 mail merge wizard. Solveig Haugland has worked as an instructor, course developer, author and technical writer in the high-tech industry for 15 years, for employers including Microsoft Great Plains, Sun Microsystems,and BEA. Currently, Solveig is a StarOffice and OpenOffice.org instructor, author, and freelance technical writer. She is also co-author, with Floyd Jones, of three books: Staroffice 5.2 Companion, Staroffice 6.0 Office Suite Companion and OpenOffice.Org 1.0 Resource Kit, published by Prentice Hall PTR. Her fourth book, on OpenOffice.org 2.0, is coming this summer. For more tips on working in OpenOffice, visit Solveig's OpenOffice blog.